What Time Is It In Will Terry’s Room? Have you ever heard someone say that “time flies when you’re having fun”? Well, time actually flies backwards in a certain seventh grade English teacher’s room. At least, according to one of Will Terry’s many odd clocks. When asked where he obtained the aforementioned “backwards clock,” Will replied, “Some novelty shop in town…” He decided the clock was worth some publicity, and so here at GFS, the clock has a home. 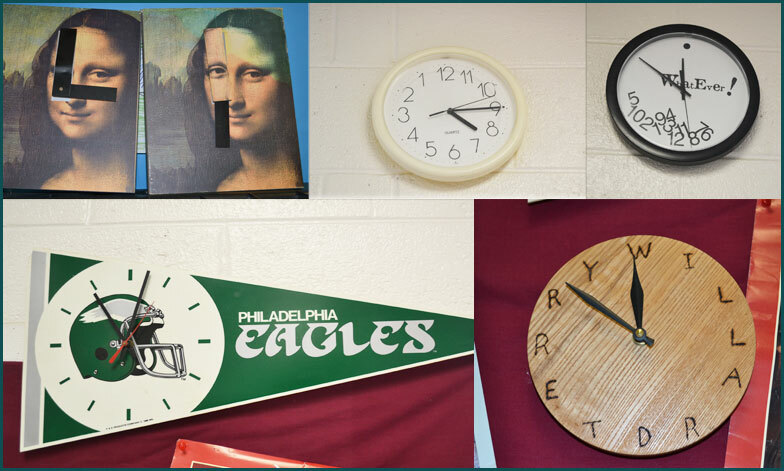 Football fans may have wondered where the Eagles clock was acquired, and their answer is: “What happens when Jeff Fetterman and Will Terry walk into a flea market?” Some of us couch potatoes might speculate (and admire) where our English teacher attained the “Whatever!” clock. Will responded that he thought it was a gift…from where or whom is unknown. The real question is: “Is our English teacher really a clock collector in disguise?” Apart from the “Willard Terry” clock, Will admits that he collects novelty clocks for the sole purpose of confusing seventh graders about the time! But he adds, “It just so happens that the Terrys and Willards were clockmakers in the 18th and 19th centuries.” Willard was Will Terry’s grandmother’s maiden name. We might never know if there is a psychological connection, but until we find out, we had all better start wearing watches! Clockwise from top left: the two Mona Lisa clocks, the backwards clock, the Whatever clock, the Willard Terry clock, the Eagles clock.